2018 No.2 - Black Jack Energy Services, LLC. 2018 No.1 - Reece Albert, Inc.
2016 No. 3 - L.A. Fuller and Sons | Wildstone Construction, LLC | Bennett Steel Inc.
2013 No. 4 - Webber, LLC | Roberto's Backhoe Service | Ranch & Oilfield Construction | Alberici Constructors, Inc.
Special Paving Issue- Cornell Construction Company | City of Arlington Public Works | J. Lee Milligan, Inc.
2012 No. 2 - Waste Control Specialists | J.W. Hughes Excavation, Inc.
2010 No. 3 - Savage Tolk Energy Services | Chaparral Energy | Paragon Contractors LLC | Atlas Paving Company | Lufkin Industries Inc.
2009 No. 2 - OK/KS/MO - Hallaman Excavation Inc.
2009 No. 1 - OK/KS/MO - TJ Campbell Construction Co.
2008 No. 2 - Haskell Lemon Construction Co.
2008 No. 1 - S & S Road Boring, Inc.
2007 No. 4 - Luckinbill, Inc.
2007 No. 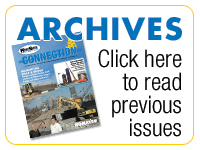 3 - Farrar Construction, Inc.
2006 No. 1 - M&M Wrecking, Inc.